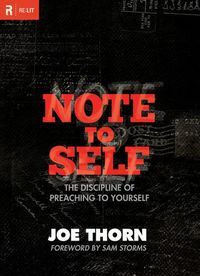 Joe Thorn is Lead Pastor of Redeemer Fellowship in St. Charles, IL and is the author of the great little book Note To Self. On this week’s Connected Kingdom podcast, Tim and I took the opportunity to ask Joe what it means to be gospel-centered, whether the gospel truly applies to all of life, and then to give some practical pointers for how to preach the gospel to yourself in joy and in pain. The phrase “gospel-centered” is fast entering the Evangelical mainstream. We are encouraged to be gospel-centered or to preach the gospel to ourselves. It is easy to say but, in my experience, far more difficult to do. This morning David Murray and I spoke with Joe Thorn about this very thing. Speaking personally I found it very, very helpful. So why don’t you give it a listen? It will take less than 30 minutes of your time and I think you’ll be well-rewarded for the effort.